You actually end up eating a lot! It’s just that you are eating really healthy foods instead of wasting your time with junk carbs, sugars, and bad fats. I’m still amazed by how much I eat now and can’t gain a pound, because I’m working out much harder with CrossFit and eating healthier foods. Traditional diets where you restrict your intake seem even more ridiculous once you discover this way of living. For our contest, we are focusing on the most dramatic body transformation by the end of the 90 day period. But, it is not about weight loss. Some of us really have no weight to lose! It is about fat loss, muscle growth, and definition. So, we will be taking before and after photos (wearing very little) and taking measurements (e.g., our biceps, chest, waist, legs, etc.). Based on where I am today, I actually hope to gain some pounds of muscle. Wish me luck! 200 M jog with stops to mix in squats, mountain climbers, jump squats, “frankenstein”, “spiderman”, etc. 5 rounds with no time limit, but went right into the Overhead Squats after each Prowler push. 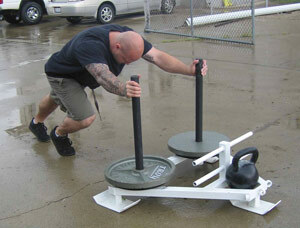 5.3.1 Military Press today was week 3 of the cycle, so it was max weight. I’m finally seeing some gains with this lift. Took longer than I expected. Did quite a bit of the foam roller today. I’m a bit sore from the dead lift yesterday and feeling the effects of all of the shoulder work this morning. A hot epsom salt bath helped as well.